Paddling sports in Southern Wisconsin have continued to build in popularity with more and more families venturing out to explore local resources via canoe, kayak, and paddle boards. Jefferson County’s unique location, in the heart of Southern Wisconsin’s Glacial Heritage Area, provides us with a wide range of paddling and boating opportunities. What is the Glacial Heritage Area? The Glacial Heritage Area (GHA) is a network of recreation and conservation lands centered primarily in Western Jefferson County, Wisconsin. The GHA project has sought to meet the growing demand for a wide range of outdoor, nature based land and water recreation activities while protecting natural habitats. A Glacial Heritage Area Water Trails guide was developed in 2009 to provide paddling enthusiasts with a comprehensive guide to all our local waterways. Water Trails are recreational waterways on a lake, river or creek, between two specific points, containing access points for the boating public. Within the GHA you will find easy access to 7 rivers and streams totaling 160 miles of moving water, and 9 lakes totaling 13,104 acres. The GHA Water Trails guide is your step-by-step guide to every accessible body of water in the GHA with 70 different Put In and Take Out sites along each body of water and detailed descriptions of each river, stream, and lake. 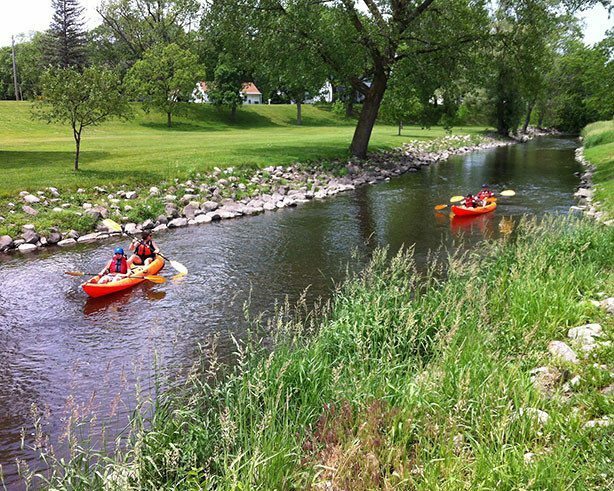 Another notable development in the GHA is the newly designated Rock River National Watertrail. Designated by the National Park Service in 2012, the Rock River became only the 10th river in the United States to achieve the status of a National Watertrail. Notable for both its historic and cultural significance, the Rock River has much to offer paddlers throughout its 320 mile course ranging from its origin in the Horicon Marsh in Wisconsin to its confluence with the Mississippi River in Rock Island Illinois. Of course you’ll enjoy yourself in nature – but should you need some supplies, be sure to check out Two Rivers in both Fort Atkinson and Watertown. They have outdoor stores that rent canoes and kayaks and organize outings on the rivers. If you’re looking for somewhere to overnight, visit Jellystone Park in Fort Atkinson and River Bend on the Crawfish River. For more detailed information, download the Watertrails Map and the Watertrails Guide from the Jefferson County Parks Department’s website, contact them directly for a copy at 920-674-7260 or stop by their office at the Jefferson County Courthouse (311 South Center Avenue, Jefferson, Wisconsin). Anyone interested in learning more about local paddling opportunities or organized paddling events can contact the Friends of the Glacial Heritage Area through their website. We hope you will enjoy the many opportunities that await you in the Glacial Heritage Area.